Receive a “Certified Iridologist” certificate at the end of all 3 levels after successful completion of all exams with a grade of 80 percent or more. If you do not receive a grade of 80 percent or more on your exam result you can redo the examination as many times as you like until you achieve the required grade. There are no additional costs for iridology course examinations. End of term exams can be emailed directly online. 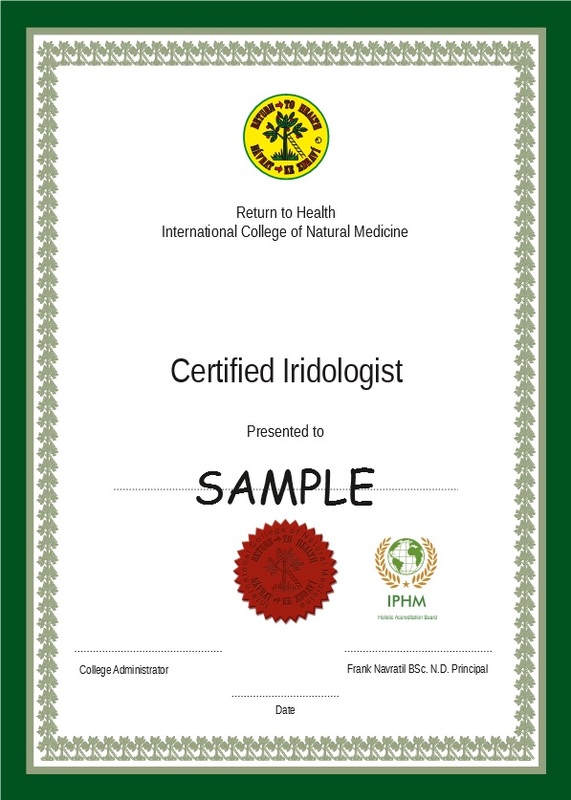 You must successfully complete all 3 levels (Iris 1, 2 and 3) to receive a “Certified Iridologist” certificate issued by the Return to Health International College of Natural Medicine. 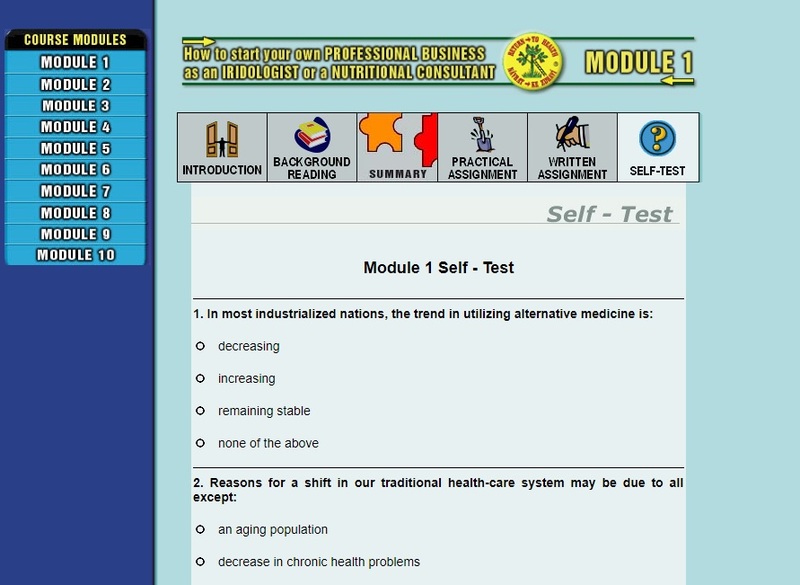 Go back to the main menu for information about the Return to Health International College of Natural Medicine. On-line support: for any problems or questions you may have during the course. Frank Navratil BSc. 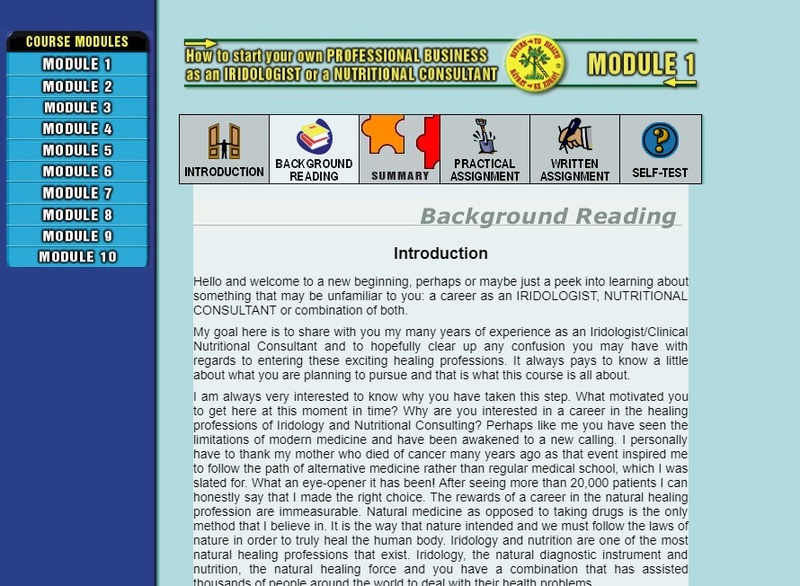 N.D. personally is available on-line to assist you during your nutrition course. 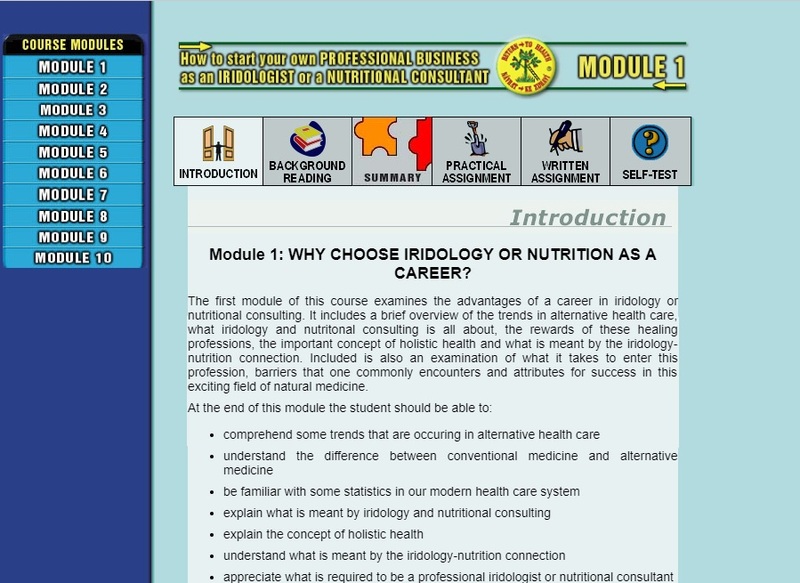 Module 1- What is Iridology? The first module of this course is an introduction to the art and science of iridology. It includes a brief history of iridology; the concepts of individuality and holistic medicine, equipment used in iris diagnosis and the importance of treating the cause of disease not only the symptoms. 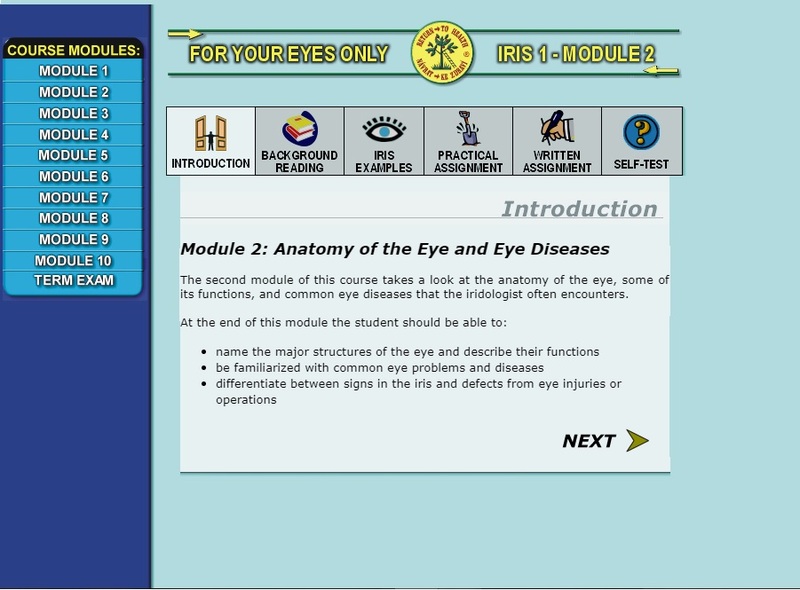 The second module of this course takes a look at the anatomy of the eye, some of its functions, and common eye diseases that the iridologist often encounters. The third module of the course examines the major zones that are found in the iris. It also describes how to determine a left iris from a right iris from a photograph. 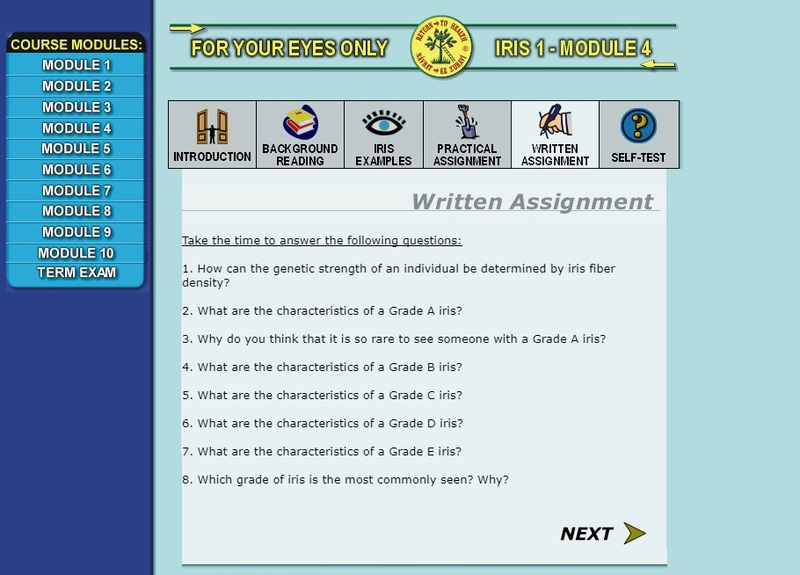 This module deals with how to grade an iris according to genetic density of iris fiber structure. 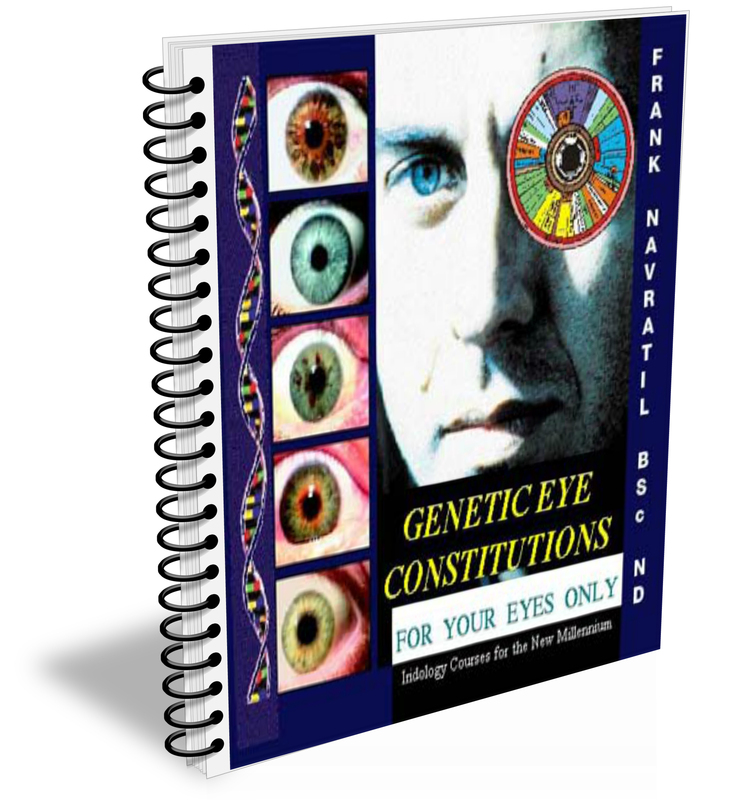 This module is Part 1 of genetic iris constitutions. The concept of genetic constitutions is introduced as well as the factors that can weaken or strengthen your genetic make-up. 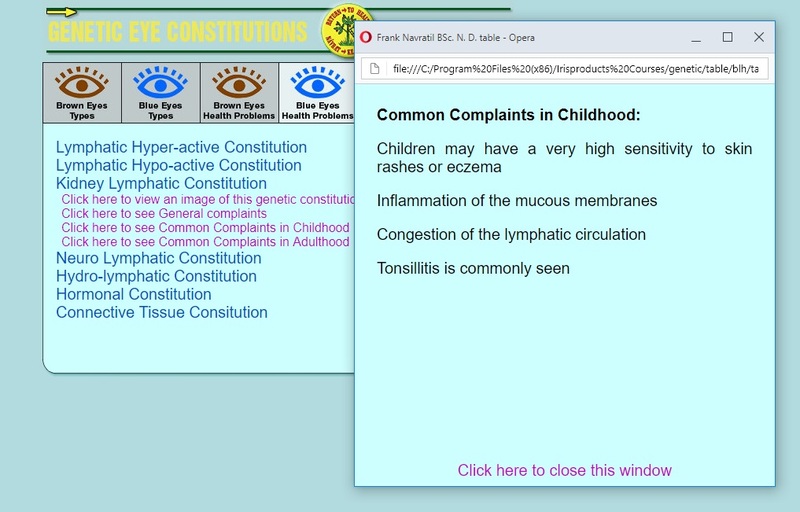 The terms genotype and phenotype are explained and all the lymphatic constitutions are discussed in detail. 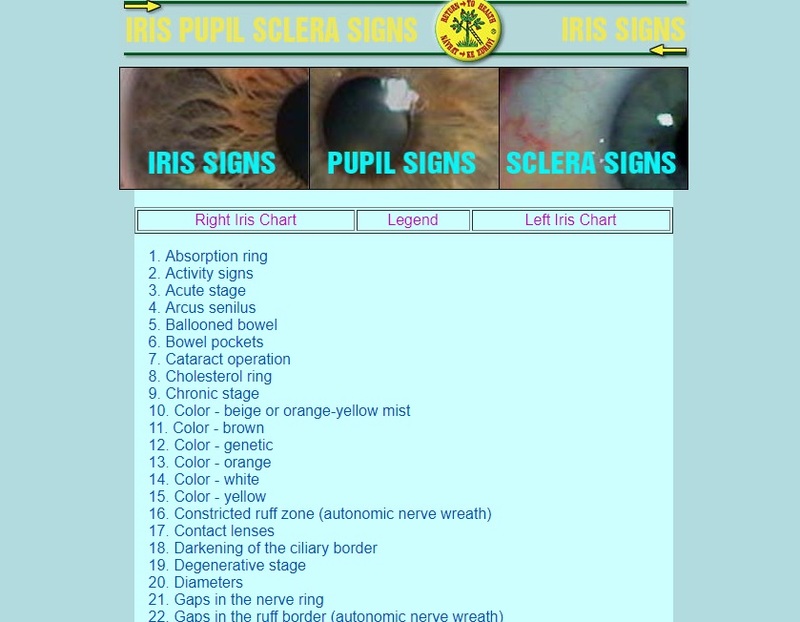 This module covers the major colors that can be seen in the human iris. 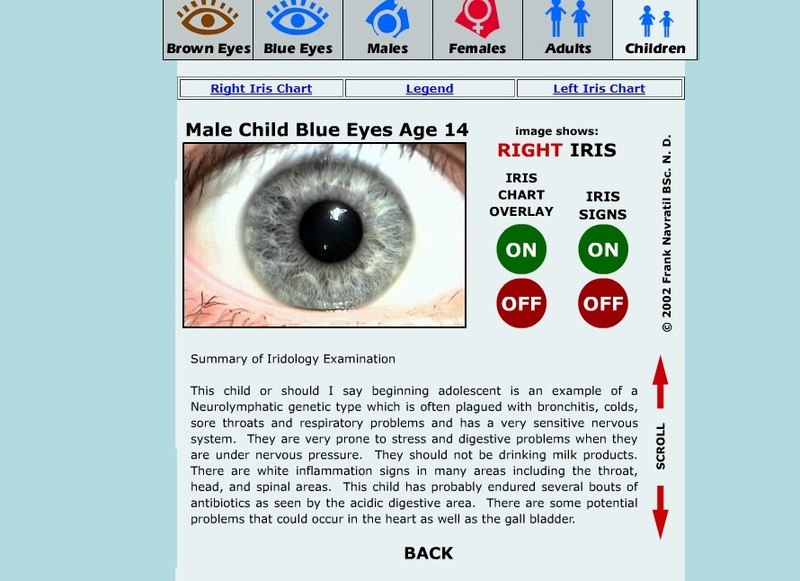 Similar characteristics among blue-eye and brown-eye types are discussed as well as the significance of various colors that can appear in the iris. 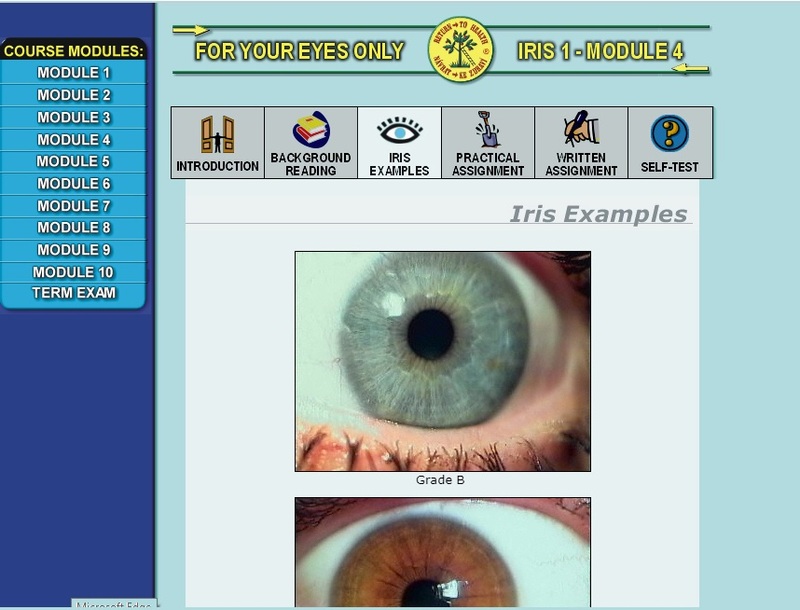 This module will introduce the iridology student to iris maps, which are used in iris diagnosis. Iris maps or charts are explained along with a brief history. 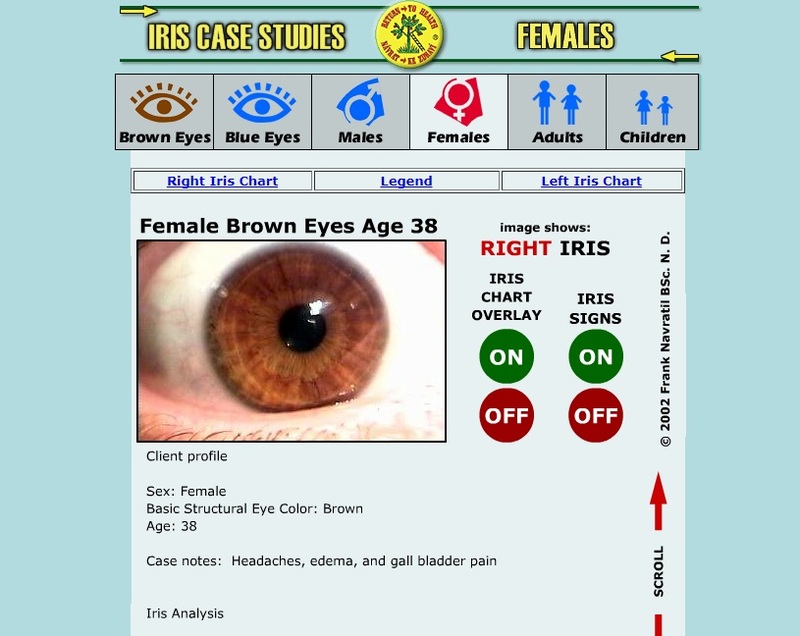 An overview of the iris chart used in this course is provided. This module introduces the beginning iridology student to some of the common signs found in the human iris and their significance. 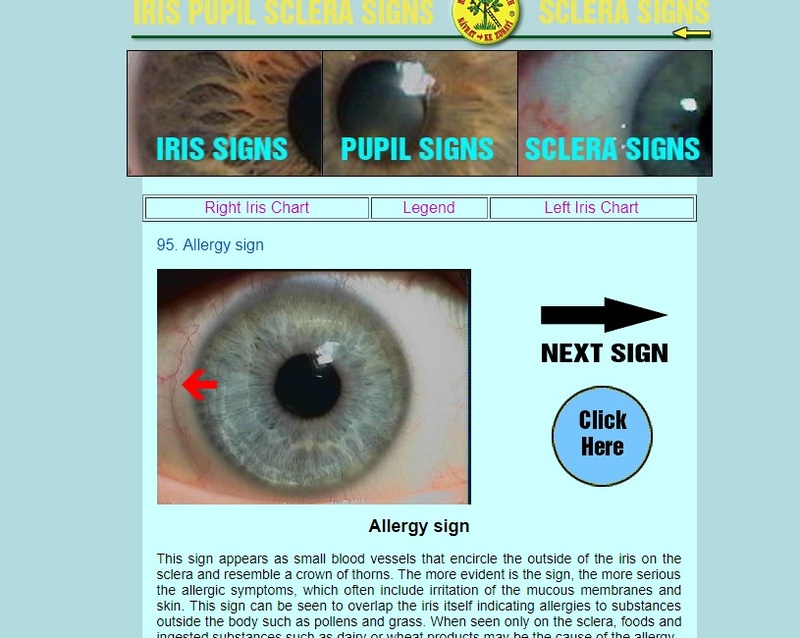 This module introduces the beginning iridology student to some of the common signs found in the pupil and sclera and their significance. 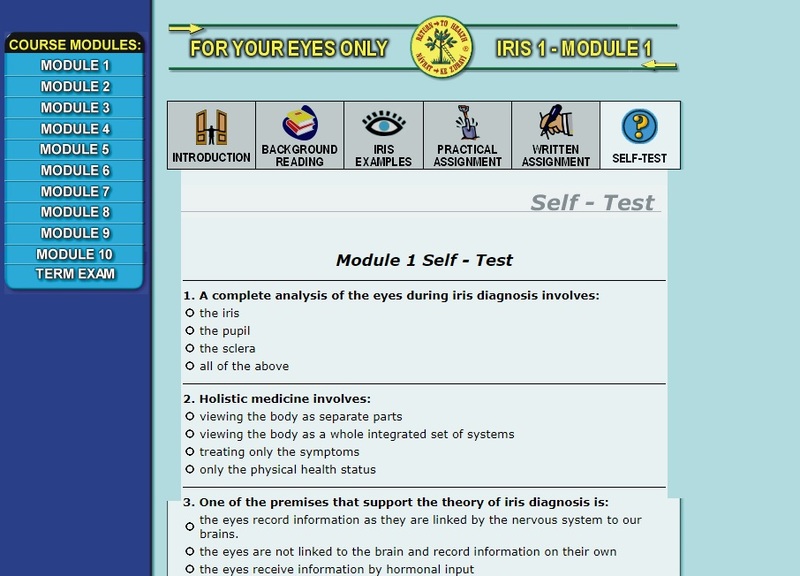 This final module in Iris I shows the beginning iridology student how to perform a basic iris diagnosis through a logical step-by-step system. It covers the topics of safety precautions, dealing with difficult clients, and filling out a basic iris diagnosis report. This examination must be emailed online to be corrected. You must achieve a score of 80 percent before you can continue to the next course level which is Iris 2. You will be notified and if you are unsuccessful you will need to resubmit your exam. There is no limit to the amount of times that you can submit this exam. There are 50 multiple-choice questions in total and they are included at the end of your Iris 1 course. Some of the exam questions include an analysis of an iris image. 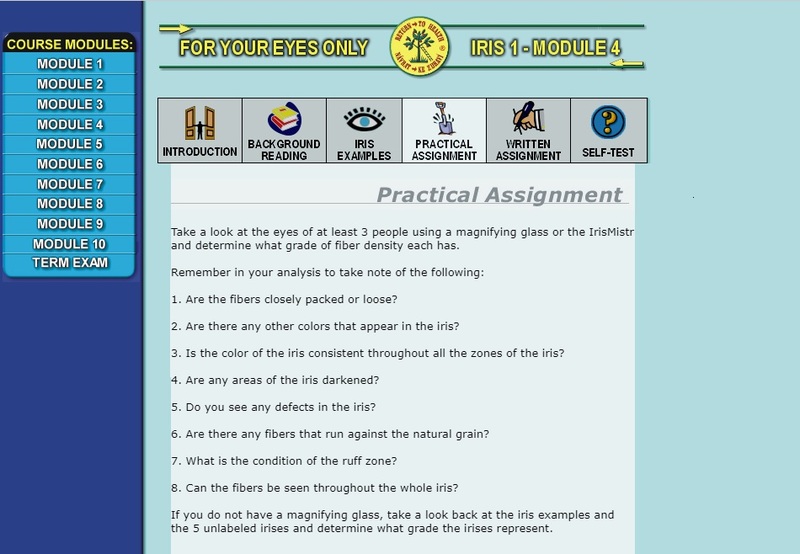 The first module of Iris 2 introduces the student to tissue changes in the iris fiber structure and how to recognize these stages and what they mean to the iridologist. The concept of the healing crisis is explained as related to iridology and natural healing. 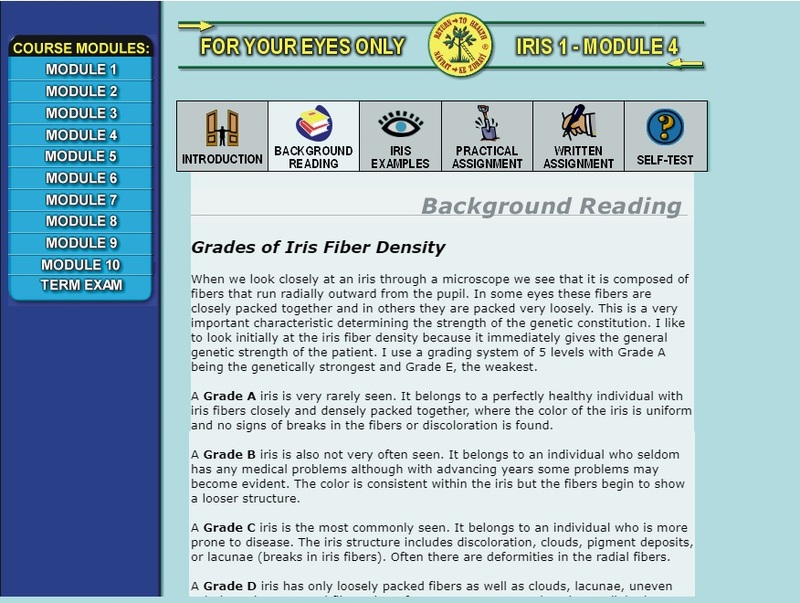 The second module introduces the iridology student to Part 2 of the genetic iris constitutions. The brown-eyed type of iris constitutions will be discussed here each with their different characteristics. This module introduces the student to the 6 essential processes of life without which one cannot achieve true healing. It prepares the iridology student for a holistic approach in diagnosis and an understanding of how systems are integrated within the human body. This module, the first of the body system modules introduces the iridology student to the digestive system. It outlines some of the digestive disorders one encounters in iridology and how they are reflected in the human iris. This module, the second of the Body Systems modules, introduces the student to the detoxification organs in the body. This module, the third of the Body Systems modules, introduces the student to the cardio-respiratory system as it relates to iridology. 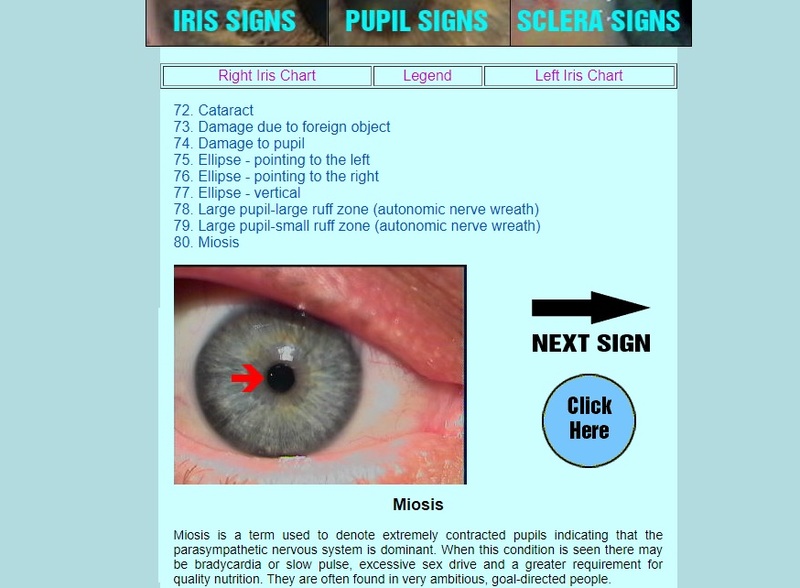 Module 7 continues with the Iris signs in Iris 1 and introduces additional signs that can be seen in the human iris. Module 8 continues with the Pupil and Sclera signs in Iris 1 and introduces additional signs that can be seen in the human pupil and sclera. Module 9 introduces the iridology student to several healing methods that are most often used in combination with iridology. These methods are briefly explained as well as their relation to the art and science of iridology. The last module, Module 10 is the first of 2 parts on Iris Case Studies. The second part, Advanced Case Studies will be explained in Iris 3. This module describes in detail the case histories of 4 real patients and the signs that are evident in each of their irises. The Integrated Systems Approach to iridology is also explained. begin to understand how an iridologist uses a holistic approach to determine possible causes of the client’s major complaints. This examination must be emailed online to be corrected. You must achieve a score of 80 percent before you can continue to the next course level which is Iris 3. You will be notified and if you are unsuccessful you will need to resubmit your exam. There is no limit to the amount of times that you can submit this exam. There are 50 multiple-choice questions in total and they are included at the end of your Iris 2 course. Some of the exam questions include an analysis of an iris image. The Iris 3 course come complete with color iris images, iris charts, self-tests, practical assignments and the Final Course examination. 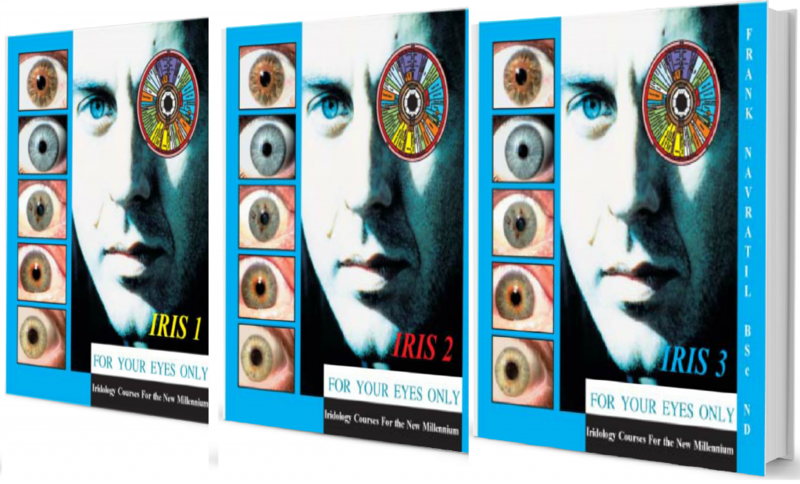 It is recommended to first complete Iris 1 and Iris 2. 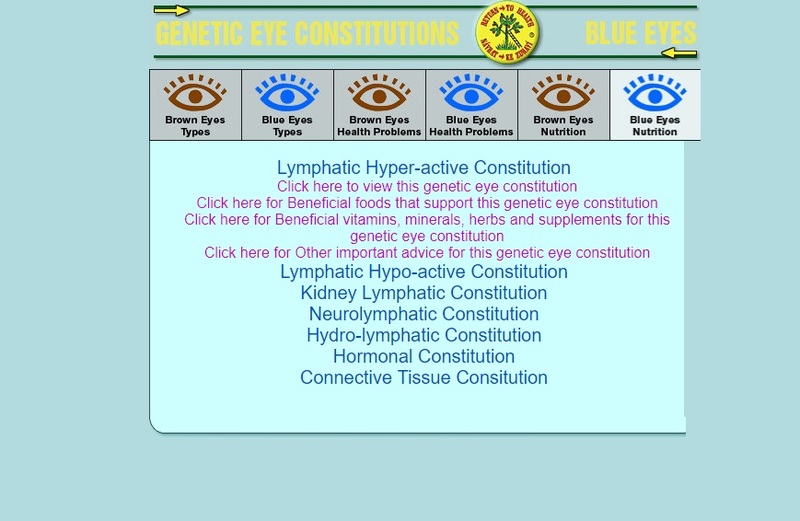 The first module introduces the iridology student to Part 3 of the genetic iris constitutions. The genetically weak iris constitutions will be discussed here each with their different characteristics. This module, the fourth of the body system modules introduces the iridology student to the hormonal system and reproduction. It outlines some of the hormonal and reproductive conditions one encounters in iridology and how they are reflected in the human iris. This module, the fifth body system module, introduces the iridology student to bones and muscles. It outlines some of the functions of the skeletal and muscular systems as well as associated health conditions and how they are reflected in the human iris. This module, the sixth body system module, introduces the iridology student to the sensory organs. It outlines some of the functions of the eyes, nose, ears and tongue as well as cause of associated health conditions and how they are reflected in the human iris. This module, the last of the body system modules, introduces the iridology student to the brain and psychological behavior in iridology. It outlines some probable causes of deficiency in brain function and how physical health is related to psychological health. A number of signs that can be seen in various sectors of the brain area are described as well as those seen in the pupil border. The significance of genetic iris constitution is discussed in relation to psychological behavior. Module 6 discusses 10 diseases of modern civilization that have not found a cure by modern medicine. Each disease is discussed in relation to possible causes that often can be revealed by studying the human iris. The Integrated Systems approach to Iridology is used in each case to find possible clues to the root of each condition. Module 7 is the second of 2 parts on Iris Case Studies. The first part was explained in Iris 2. This module describes in detail the case histories of 5 real patients and the signs that are evident in each of their irises. There is a brief review on the Integrated Systems approach to iridology (discussed in Iris 2) to refresh your memory. 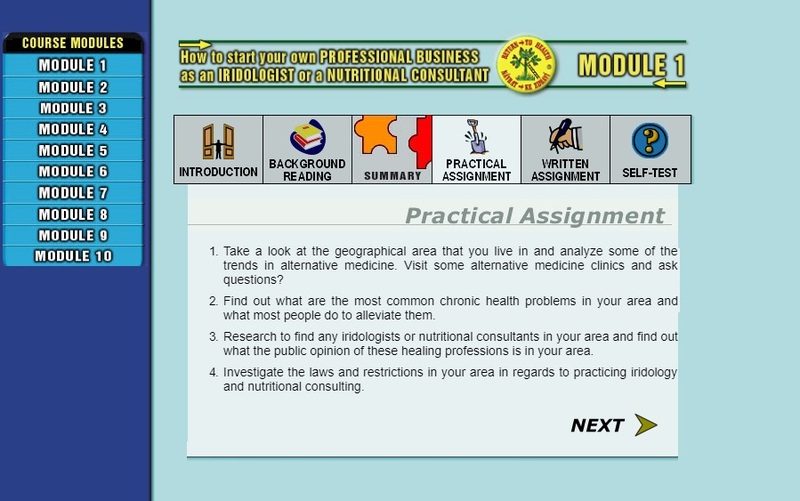 Module 8 introduces the iridology student to advanced concepts in iridology. These include variations of signs already seen in the iris and pupil and more extensive applications in iridology. 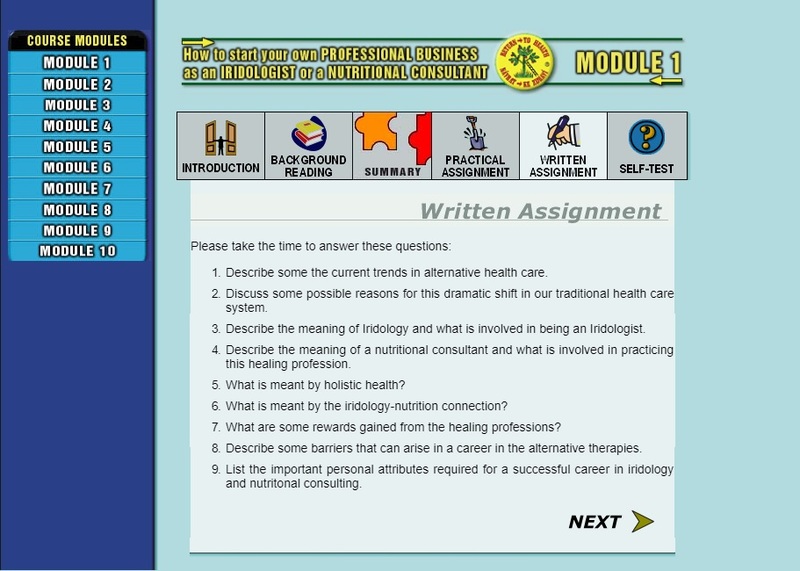 In Module 9, guidelines on how to produce a professional iridology report are discussed. 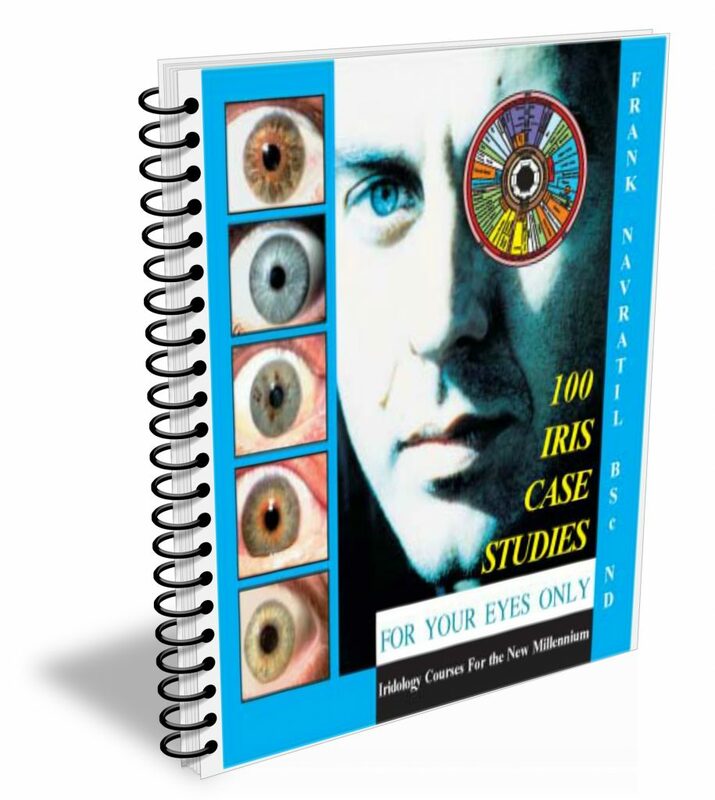 A sample copy of a professional iridology report is included. 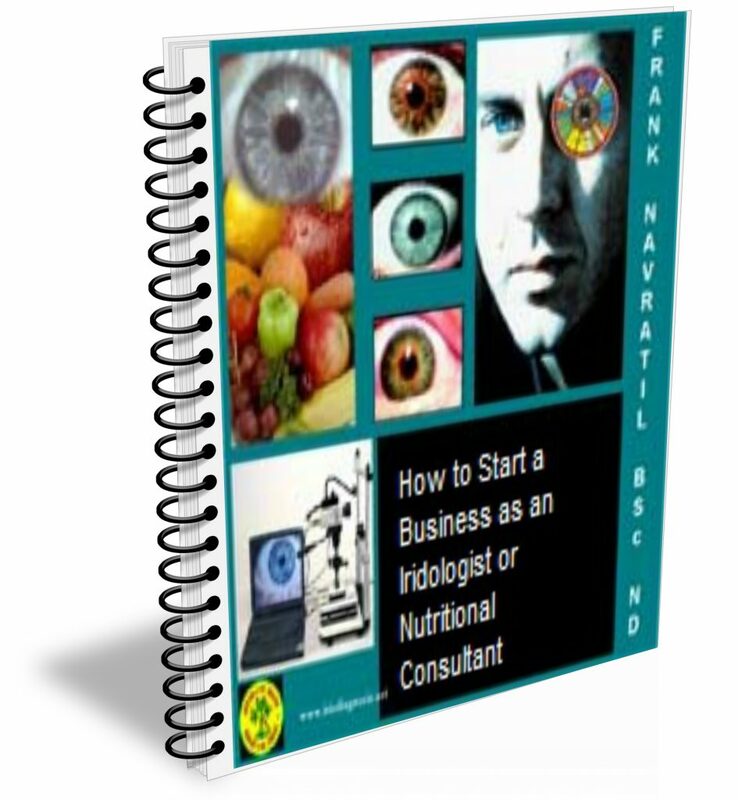 A list of guidelines and advice on setting up a professional practice is also included for the iridology student who would like to pursue a career in this exciting field. Module 10 is a summary overview of all the concepts introduced in each module of Iris 1, Iris 2 and Iris 3. You should be familiar with all these concepts and it is recommended that you review the relevant modules that you are unsure of before attempting the final course examination. This examination must be emailed or sent by post to be corrected. You must achieve a score of 80 percent or more to receive a “Certified Iridologist” certificate. Prior to this you must have successfully completed Iris 1 and Iris 2. It is not possible to submit your final course examination if the prior has not been completed. This certificate will be mailed to your address. You will be notified if you are unsuccessful after which you will need to resubmit your exam. There is no limit to the amount of times that you can apply for the certificate. There are 100 multiple-choice questions and they are included at the end of Iris 3. Most of the exam questions include an analysis of an iris image. 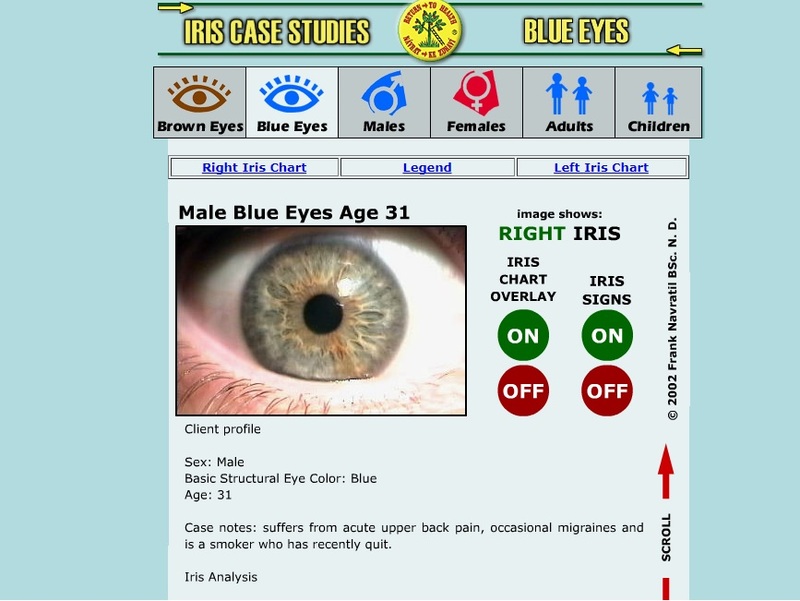 “For Your Eyes Only” Iris Case Studies is an interactive resource and an Iridology educational tool developed by world renowned iridologist, naturopath and clinical nutritionist Frank Navratil BSc. N.D. It is one of the most advanced studies of actual cases ever to be compiled. 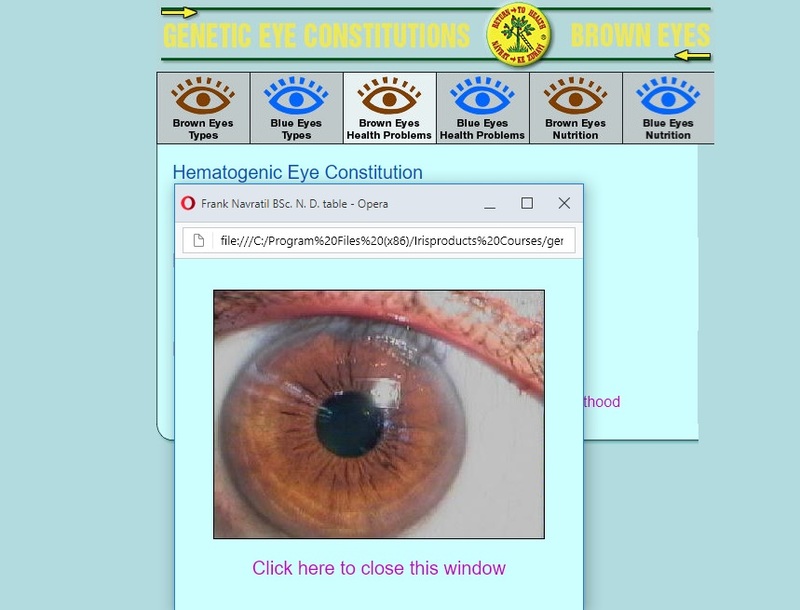 When you click on any of the case studies a display panel will appear which will include images of the client’s right and left eye, as well as written information on the client profile, genetic constitution, iris signs in the right and left eye, and a summary of the Iridology examination. 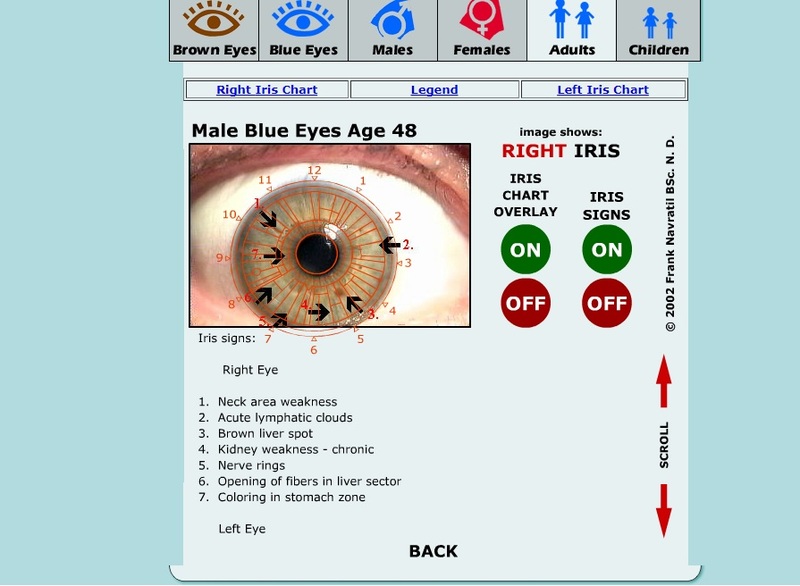 This interactive learning tool allows you with the touch of a button to overlay an iridology chart on every right and left iris or to display iridology signs labeled on each iris. This allows you to not only see what iridology signs are present but also in what sector of the iris they are located. You can also opt to enlarge or zoom into the iris image. 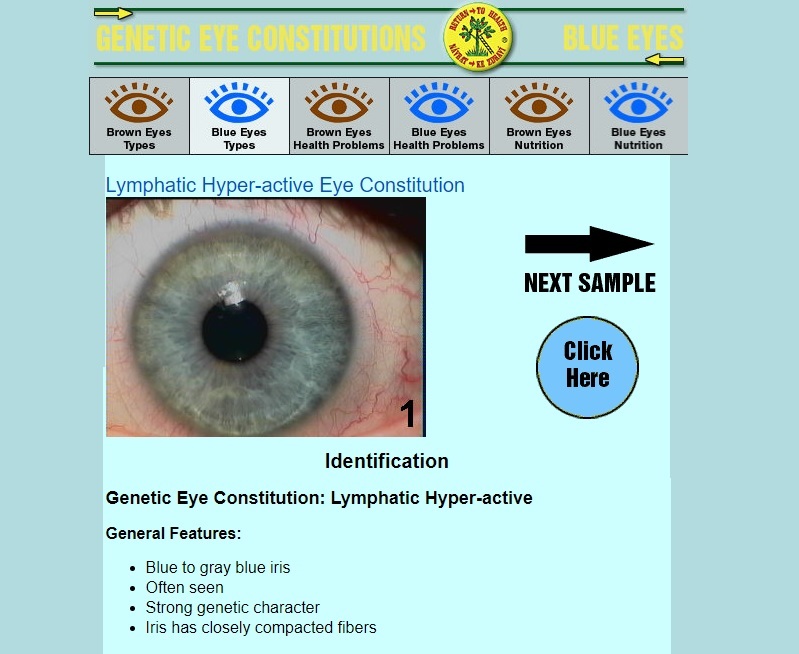 The Genetic Eye Constitutions include all the major blue-eye and brown-eye types found around the world and offers identification of each of these types with common features and constitution signs, related health problems, and nutrition and lifestyle advice. Included are over a 100 samples of iris images many of which are labeled, identifying common constitutional signs. 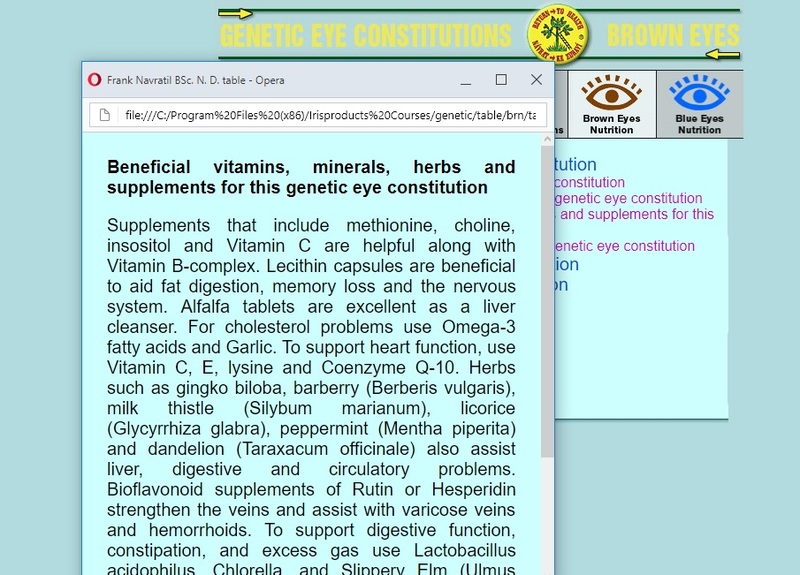 General features of each constitution are clearly explained so that even the beginner can learn to accurately identify each of the genetic types and to learn to prescribe specific nutritional therapy and lifestyle advice. 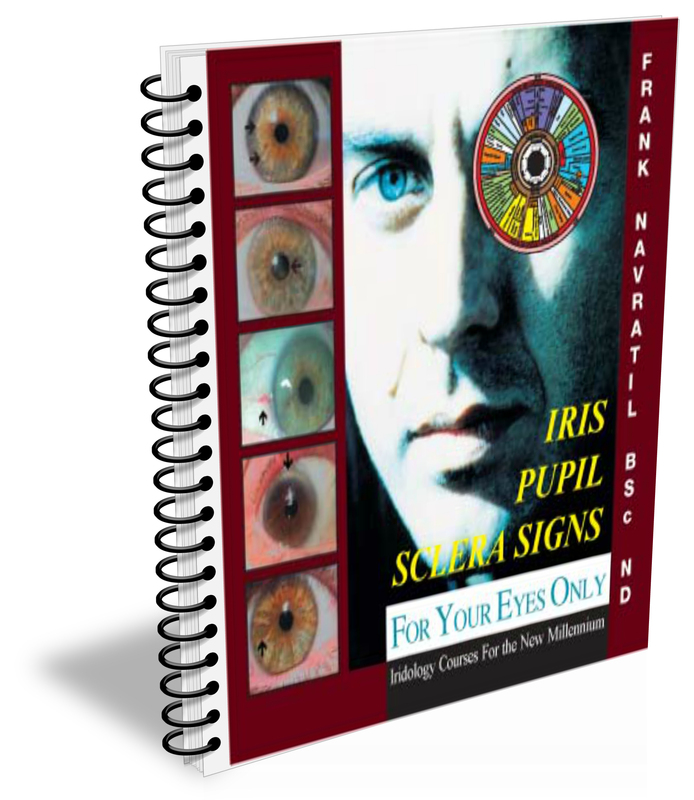 “For Your Eyes Only” Iris, Pupil and Sclera Signs is an interactive and an Iridology educational tool developed by world-renowned iridologist, naturopath and clinical nutritionist Frank Navratil BSc. N.D. It includes research from real-life patient studies over many years from his successful European Naturopathic practice in an easy to follow interactive format. 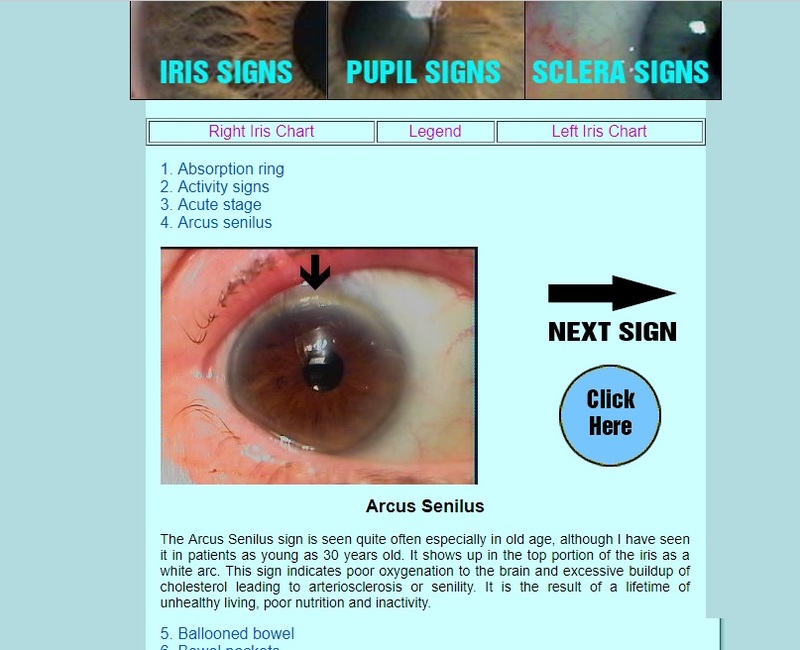 It is one of the best collections of iris, pupil and sclera signs found in a comprehensive downloadable resource. 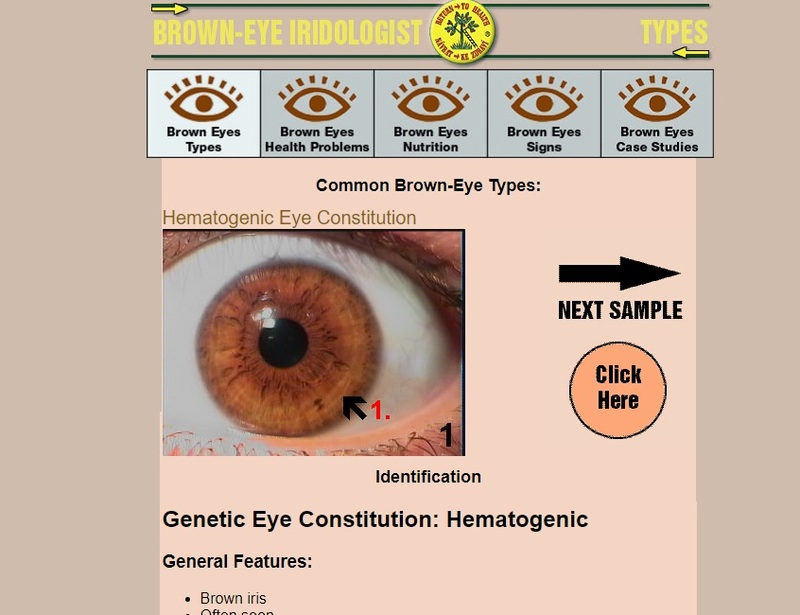 This resource has been designed for those who would like to learn all about the human brown iris and especially for those living in areas of the world where brown-eye types predominate. 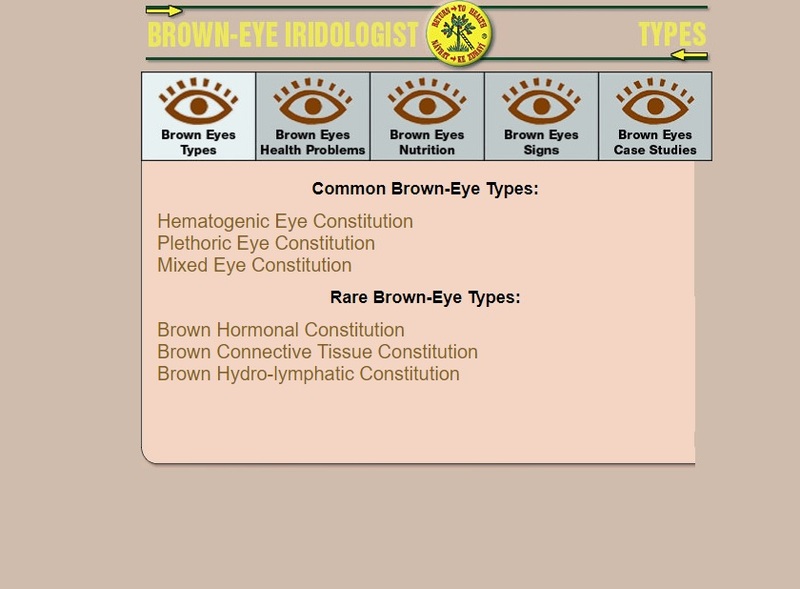 The Brown-Eye Iridologist includes all the most common brown-eye types as well as the rare types found around the world and offers identification of each of these types with common features and constitution signs, related health problems, and nutrition and lifestyle advice. 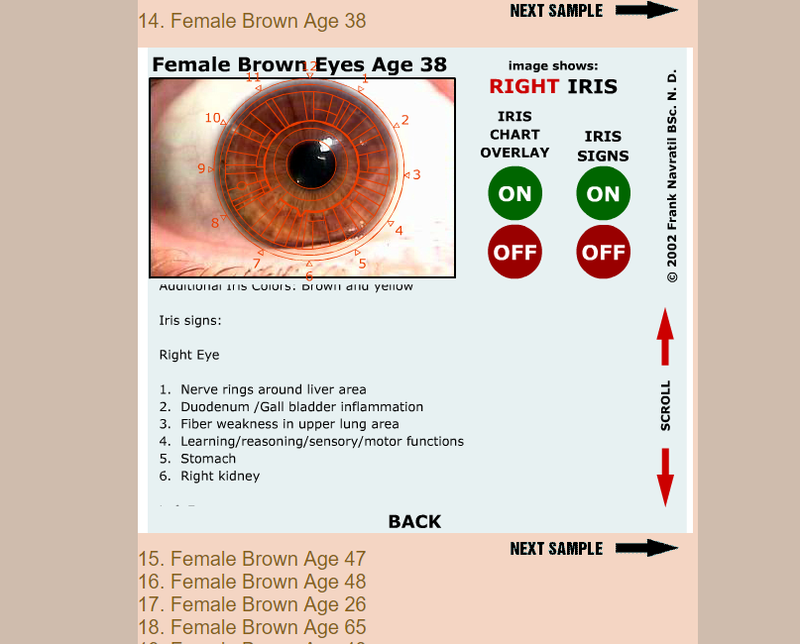 Included are over 130 samples of brown iris images many of which are labeled, identifying common signs and specific information related to the brown iris. 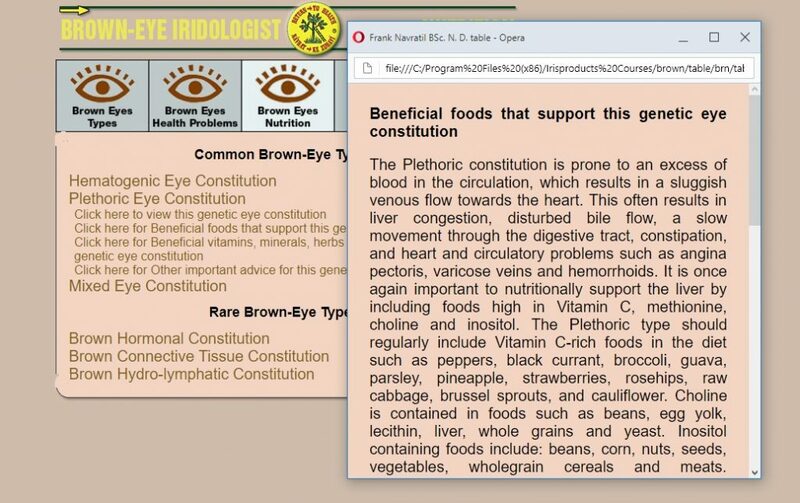 General features of each brown-eye constitution are clearly explained so that even the beginner can learn to accurately identify each of the genetic types and to learn to prescribe specific nutritional therapy and lifestyle advice. 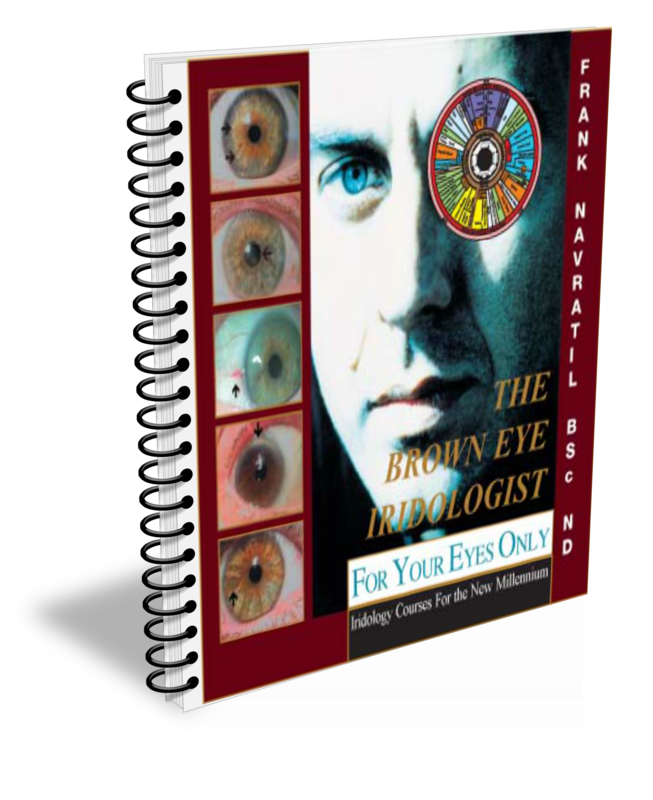 Also included are 38 brown-eye case studies with images of both right and left irises, interactive iris chart overlays and iris signs, taken over many years from the naturopathic clinic of Dr. Frank Navratil. These brown-eye case studies include male, female and child patients with a variety of diseases including cancer, diabetes, liver and gallbladder disease, digestive problems, eczema, mononucleosis, high cholesterol, arteriosclerosis and heart problems, allergies, asthma and many others. 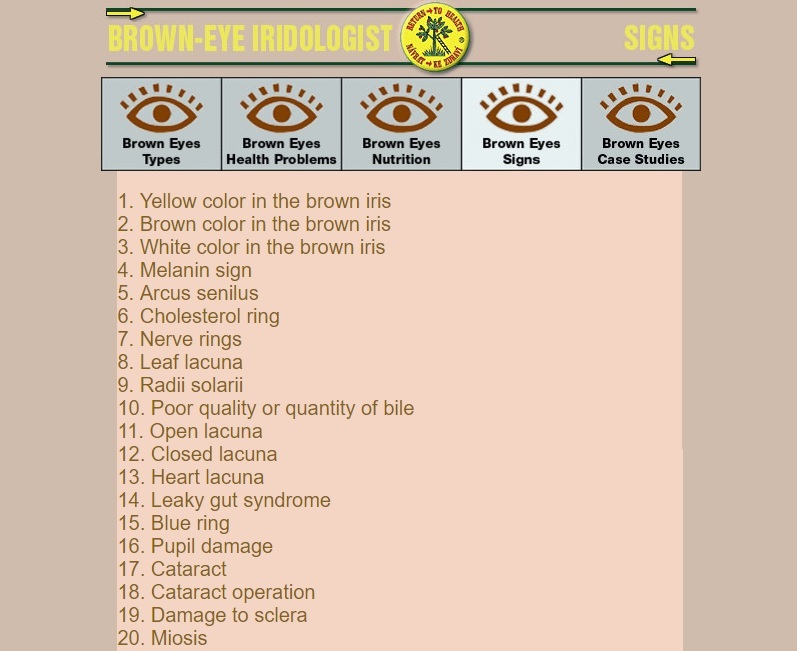 Often a very difficult iris to analyze, the brown iris has never before been so easy to learn and so clearly explained.